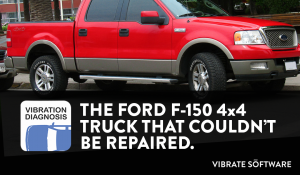 The Ford F 150 That Could Not Be Fixed - Vibrate Software, Inc.
Another memorable “can’t be fixed” vehicle was a new full sized Ford F-150 4X4 Truck. The service manager described the history of this vehicle including the fact that a front suspension leveling kit had been installed. I learned that in an attempt to repair the vibration, the dealership service department balanced the tires several times but did not know what else to do to correct the vibration concern. I told the service manager that the leveling kits would change the angles of the front CV joints on each end of the half-shafts coming out of the front axle. I informed him that CV joints rotate at a constant velocity only when their working angle is less than 50% of the maximum working angle limit. The leveling kits may be causing the 50% limit to be exceeded causing the CV joints to pulsate as they rotate. The only way to fix this vehicle is to remove the front suspension leveling kit. There were no bad parts on this vehicle, aftermarket parts (the leveling kit) caused the vibration to occur. The unhappy customer has to choose between having a level truck or a tire speed vibration. Hundreds of dollars were wasted on attempted repairs, many hours of labor were wasted because nobody really knew how to diagnose a vibration problem; they were just guessing! The NVH app eliminates the guesswork in vibration diagnosis and guides you step-by-step through the entire diagnostic and repair procedure. Get the NVH app today by clicking on the link below. I want to know that NHV APP can detect noise noise from frt shock absorbers, frt stabilizer bar bushing, front stabilizer linkage and noise engine accessory engine is idle. The NVH app is a vibration diagnostic tool, to was not designed as a noise diagnosis tool. If those parts are vibrating, chances are good that they are vibrating in response to a vibrating part that the NVH app can diagnose. I hope that helps.